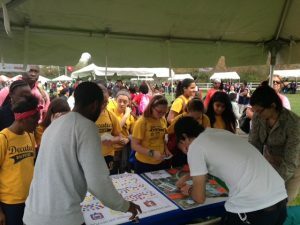 Over 200 curious young visitors stopped by the APAPA-SE activity booth at Temple University’s EarthFest 2016 on April 22nd. 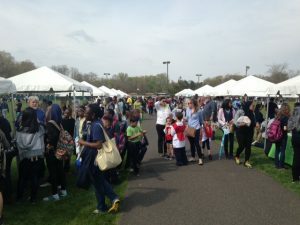 An annual event at the Ambler Campus, EarthFest promotes environmental awareness to elementary and middle school students from across the region. Continuing a multi-year tradition, APAPA-SE hosted a booth to support the effort. 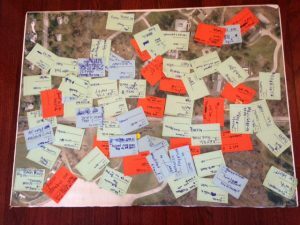 This year, our four volunteers engaged students in two planning activities – one related to transportation and the other land use – to give them a very basic idea of what planners do on a regular basis. The transportation-related activity had students placing stickers to indicate whether they walk, bike, drive, or take the bus to get to school, visit friends/family, visit park/playgrounds, and go shopping. While not exactly scientific, this informal survey had over 230 responses and provided some interesting results (see the tally we put together and feel free to draw your own conclusions). 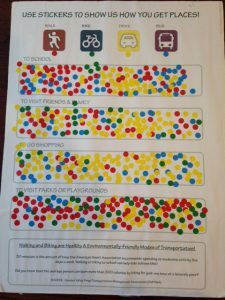 Overall, the kids were really excited about the activity – especially the stickers – and it got them thinking about the pros and cons of how they travel, both for their own personal health and the health of the environment. The second activity, which we introduced last year, focused more on land use and development. Using an enlarged aerial map of the Ambler Campus, we showed students exactly where on the map they were standing. We then described the surrounding land uses to help them think about what else they’d like to see on the field where the event was taking place. Finally, we asked them to respond to this question: What would I plan for this lot and why? It was amazing to see the variety of responses we received – it was almost like hosting a town hall meeting! Each year, Temple’s Earthfest gives us planners an opportunity to engage local students in a light-hearted yet meaningful dialogue about the important work we as planner do every day. And, who knows, perhaps we inspired a whole new cohort of APA planners!